So for those who don't know I lost my 18 year old Siamese, Misty in september to kidney disease. After missing her like crazy for a few months I finally broke down and found 2 kittens at a shelter. Heidi is a siamese mix and is approximately 8 months though at first they thought she was 6. Cally is a calico and is 5 months. They are sweet and fun but very different in temperament- Heidi, loves treats, turkey, meat of any kind, will play fetch when she's in the mood and if I head to the kitchen she practically races me there. She is a bit skittish about being petted when she is lying down, but wil purr like crazy if I pick her up facing me and put her on my lap. Cally, has no interest in "treats like greenies etc. most cats love_ She is my little trouble maker- the first to investigate the wires behind mama's computer or tv and by now she thinks her full names is Cally NO I could hang her by her feet though and she would purr. She loves to have her tummy rubbed and is the first to wake mama up- usually at 5 AM and the first to jump up for her morning tummy rub..
A few weeks ago I dared to do something that in retrospect maybe wasn't such a good idea. I put up my artificial tree. Assuming if I put it in the bedroom where they can't be unless I'm there I'd be safe. I will let the pics below tell the story of how well THAT worked out! 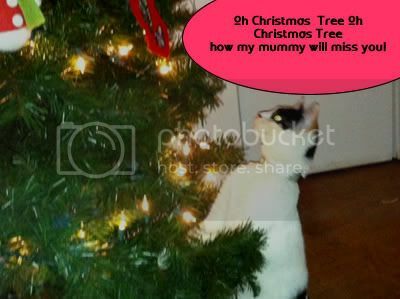 So what is christmas like with your pets? I had a dog growing up and I can't remember her doing anything crazy around the tree. We did however make her a stocking (probably was me) that we would fill with dog treats. Sounds like you have some very active and curious kittens! I�m sorry for your loss! When we get attached to a little friend like that it�s always difficult to go by a moment like that... My son lost his dog and now has a female cat, "minie", and she like a member of the family. 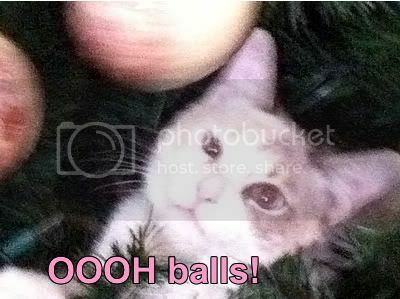 Your new furry friends are really cute, Mary Ann!!!! 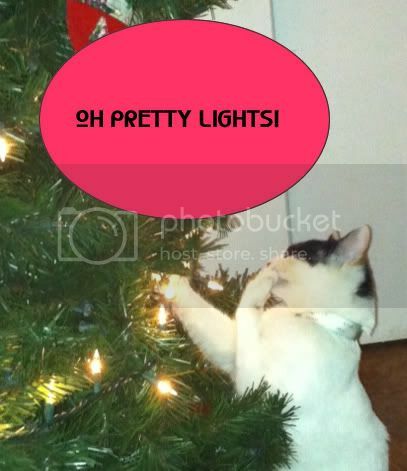 It's not even just the lights they just like climbing in and out of the tree! Its scary how much like that! 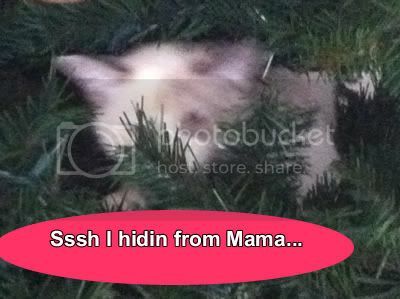 I am going to just give them the tree to play with on christmaill post video!